One of the defining characteristics of this interest rate cycle (and to a lesser extent, the previous cycle) has been the persistent forecast errors by central banks as well as the market consensus regarding the timing of "renormalisation" of policy rates. The standard explanation is that this can be explained by the reality that there was poorly timed fiscal austerity across the developed economies interacting with the fact that policy rates have hit their lower bound near zero. Alternatively, it may be that interest rates have less impact on the real economy than is commonly assumed. There was not always a very strong consensus on the subject; for example, there was a debate about the impact of interest rates on inflation during the 1970’s. As shown in the chart above, higher interest rates have been associated with higher inflation. However, the empirical analysis done since then has been broadly interpreted as supporting the view that raising interest rates lowers inflation rates. More recently, economists associated with Modern Monetary Theory have been arguing that monetary policy is relatively ineffective. This leads to the proposal by Mathew Forstater and Warren Mosler to lock interest rates at zero, as very little policy flexibility is lost in their view. I will write a series of articles discussing this theme, as this is a critical subject for understanding monetary policy. At present, I am somewhat agnostic on the topic. Monetary policy is clearly effective under certain circumstances; conversely central banks as well as the markets have been incorrect about how stimulative the current regime of low interest rates would be. This does require a fair amount of empirical work, as theory can tell us very little about this topic, since we cannot know in advance the relative power of effects which act in opposite directions. Monetary Policy In Theory And Practice Lars Horngren, Swedish Riksbank. How Monetary Policy Works, Bank of England. On that page, there is this pdf which has more detail on the transmission mechanism. The Natural Rate Of Interest Is Zero (Mathew Forstater and Warren Mosler). System Dynamics of Interest Rate Effects On Aggregate Demand, L. Tauheed and L.R. Wray. Looking forward to this. Definitely a topic that deserves more attention in the blogosphere. I'll take a look. But my feeling is that I would classify these as fiscal policies, as the name they use suggest. What I consider to be monetary policy is interest rates and open market operations; I would view some central bank activity like purchasing gold in a non-Gold Standard country as fiscal. The fact that the central bank does these activities is more of a historical accident, which makes analysis messier. they are fiscal as you point out, just carried out by the central bank. The basic point is the government was running an overall budget deficit equal to 75%-78% of GDP (40% of GDP due to interest payments), and the central bank was paying 900% interest on bank reserves. Yes, high interest rates did not reduce inflation. But I guess the response would be that real rates were negative. How could they have made the real interest rate they paid on reserves positive? i.e what would they have had to do? The real interest rate is the nominal interest rate less than inflation. According to the standard view, real rates are what matters. So they needed to hike rates above the very high inflation rate; even 900% annual rates were below the rate of inflation. I have mainly looked at developed markets, and the highest inflation rates were only around 10% or so, so I do not have a lot of experience with hyperinflations. I have some ideas on the subject, but I want to read up a bit more onn the topic myself. "So they needed to hike rates above the very high inflation rate"
Yes. That effect is the "interest rate channel" that I talked about. The view that high real rates combat inflation is the mainstream view, which I have doubts about. In the case of a hyperinflation, I think high rates are definitely a source of inflation. In developed economies with inflation under 10% or so, it is possible that the mainstream view is correct. 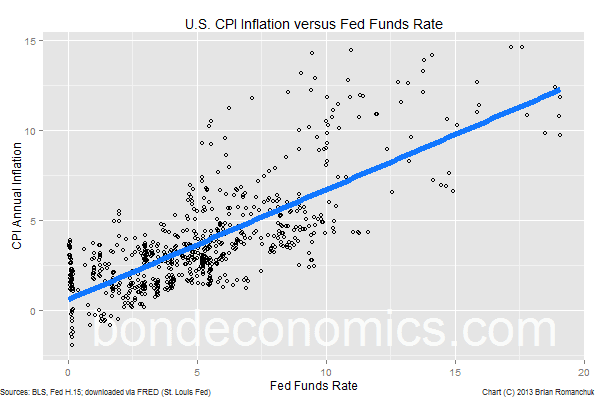 The mainstream will point to a lot pf empirical work which shows that high real rates reduce inflation. But if you see my post from last week about DSGE model identification, it may be the empirical studies are picking up something else, and attribute it to real rates.